Nerves? Bring ’em On!! Managing Butterflies! Home/Erika Carlson's Blog, Mental Toughness, Mental Training, Sport Psychologist, Sport Psychology/Nerves? Bring ’em On!! Managing Butterflies! Invite em. Don’t fight em. 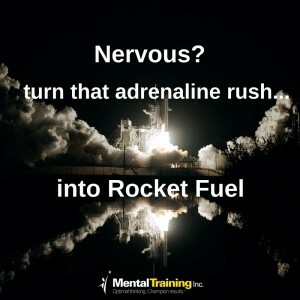 Letting that rush of adrenaline making you nauseous? Turn it into Rocket Fuel! Get MORE tense. Then try to breathe. Really. Try it! To figure out what the heck we’re talking about. Read Erika Carlson’s blog Managing the Butterflies for solid tips on what to do with those pre-game jitters. CEO and Certified Mental Trainer at Mental Training Inc.